The PS OWA filament was the first one of our range of 3D printing filaments here at Armor 3D. 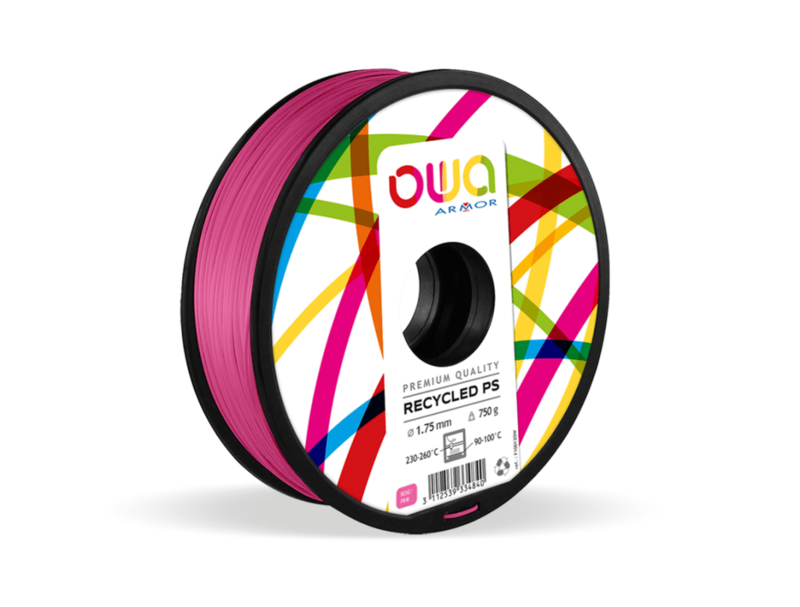 Officially launched in October 2016, it’s the first recycled and recyclable filament on the market. It required as much as two years of R&D. But what is PS? Let us review its features, pros&cons and tips for printing so that we get a better understanding of this unique material. Crystal Polystyrene (GPPS): a hard, breakable and transparent material. Shock Polystyrene (HIPS): a flexible, resistant and opaque material. Polystyrene can be used in a wide variety of products ranging from hangers to food containers, including razors, fridge doors and so on… It is often used for food related applications such as for yoghurt cans. However, our product is not suitable for food contact because of its recycled nature. What does OWA PS offers ? 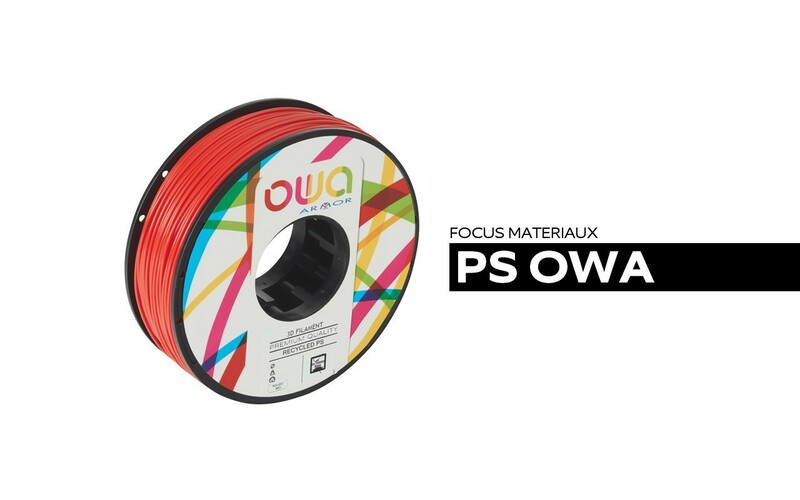 OWA PS filament is the first Polystyrene filament on the 3D printing market. To craft that filament we developed our unique and secret formula from shock polystyrene coming from recycled yoghurt cans. Currently, 30% of the filament comes from this source and we hope to increase that figure in the months to come. OWA PS filament possesses unique features, such as its printing speed, reaching 700 mm per second, quite an exploit in the field (it is to be noted that this is not the optimal printing speed though). The material has an excellent dimensional stability after being printed and offers good electrical isolation performances. Its mechanical properties remain stable in temperatures ranging from 40°C to 70°C. It is also acid, bases and saline solutions resistant. It’s unique mat aspect is a result of its formulation, as this kind of polymers is usually shiny. Health wise, the filament presents no health threat or toxicity, according to lab tests. No traces of Volatile Organic Compounds (VOC) that present a health hazard were found. According to our study, users in proximity of a machine using OWA filament do not expose themselves to levels of toxicity higher to what advised by competent authorities. However, PS has some drawbacks, such as requiring a heating bed to be printed. It can also dilute in certain alcohols such as limonene. How is it different from PLA or ABS? 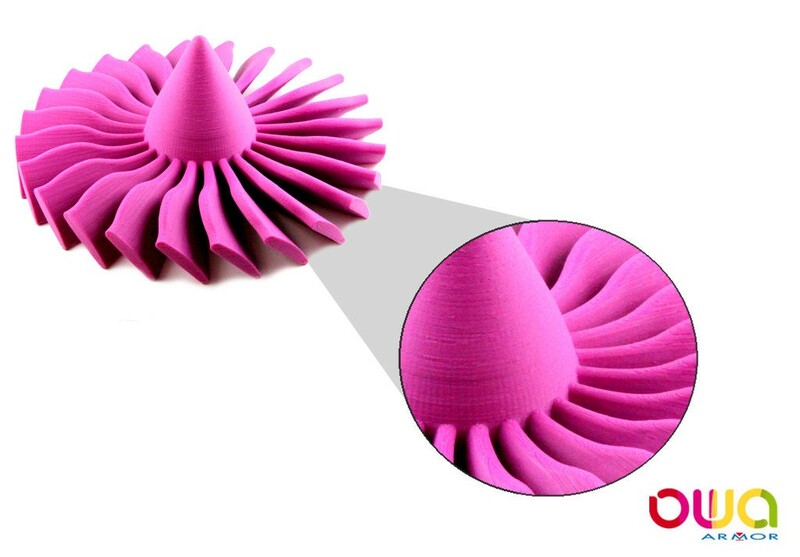 PS shows better mechanical properties than PLA because it can withstand humidity. It has a better resistance to temperature and to outdoor conditions. Compared to ABS, OWA PS shows better features when it comes to printing, as it warps less. ABS and PS have the same mechanical properties, but PS does not produce toxic fumes when being printed, comes from recycled sources and has a better look after impression, sometimes dispensing from the post production process. What are the printing parameters for PS OWA? According to the different applications (the possibilities are endless), the parameters can differ. It is important to assess how the final object will be used to influence the density of the object (the infill). Do not hesitate to get in touch with us for more ample information.